We are the Saskatchewan Distributor for BECS Technology. 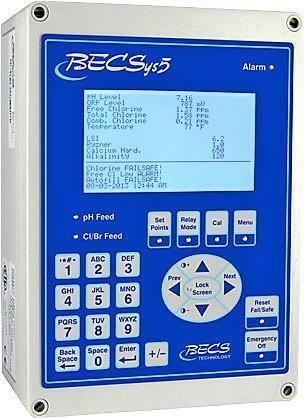 BECS make a wide varity of chemical controls that will increase your chemical dosing effecienty. By adding chemicals when needed there is not an overuse of chemicals in your pool reducing costs for extra chemicals and the increased cost in maintaince due to over-chlorination. We can get a large line of controllers from numerous other manufactures if you require a specific brand. We can install these in most situations whether it is a gas, liquid, or errotion(puck) feed. 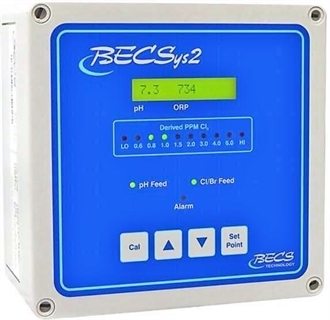 The BECSys5 Water Chemistry Controller is our “go to” choice for monitoring and controlling the sanitizer and pH levels in medium to large size commercial swimming pools. The standard unit comes with a flow cell, pH, ORP, and temperature sensors, 100BASE T Ethernet connectivity, the BECSys for Windows software package, and a 5-year warranty for the electronics with a 2-year warranty on the sensors. There are also four solid state relays with a number of assignable functions and expandable modules and sensors to do everything from monitor your TDS to control your pump and heater. Upgrade to the EZ Connect communication board and have a completely secure connection to the controller without needing to worry about firewalls, VPNs, and IT specialists. Please see the cut sheet for the full list of features and options available. Everything available in the BECSys5 is also available in the BECSys7; the BECSys7 just has more! More relays (four solid state, and 5 mechanical) and more 4-20 inputs (up to 8 inside the box), with the additional option of having Filter Backwash Control. The BECSys7 is one of the most advanced control systems available in the aquatics market today. A basic with few options, the BECSys3 system has an easy to use interface without sacrificing any reliability. 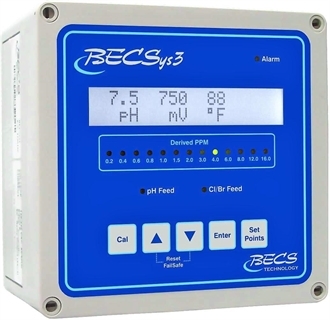 Using the same membrane or non-membrane style sensor as the higher end BECS controllers, the optional free chlorine sensor makes the BECSys3 controller one of the most economical controllers to have chlorine parts per million (ppm) measurement and control. A simple to use, basic controller for smaller commercial sites with basic chlorine and pH control. The BECSys2 uses the same sensors for sanitizer and pH control as all of the other BECS controllers it just comes in a smaller package! Click to Download BECSys2 Quick Ref.